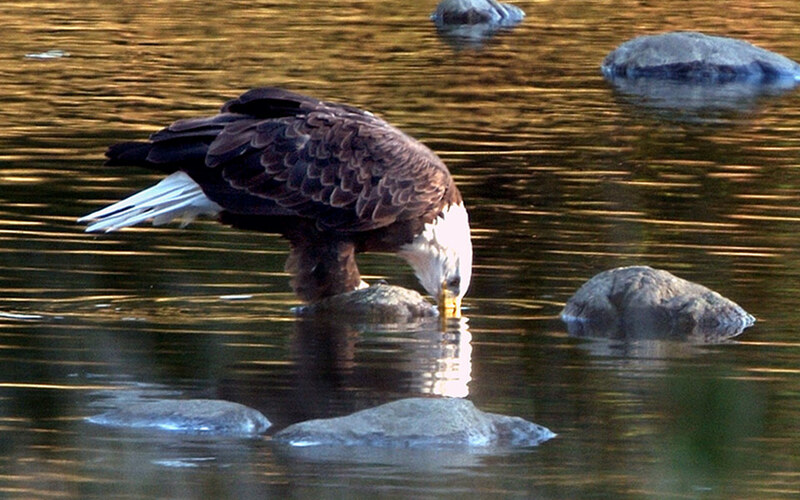 Eagles, like people, need healthy habitat to survive and thrive. The Delaware Highlands Conservancy works to protect healthy lands and clean waters throughout our region, and has protected more than 14,000 acres to date. These lands and waters provide ideal habitat for wintering and breeding eagles in the Upper Delaware River region. Read Breeding Eagles for more information on the resurgence of the eagle population in our region. 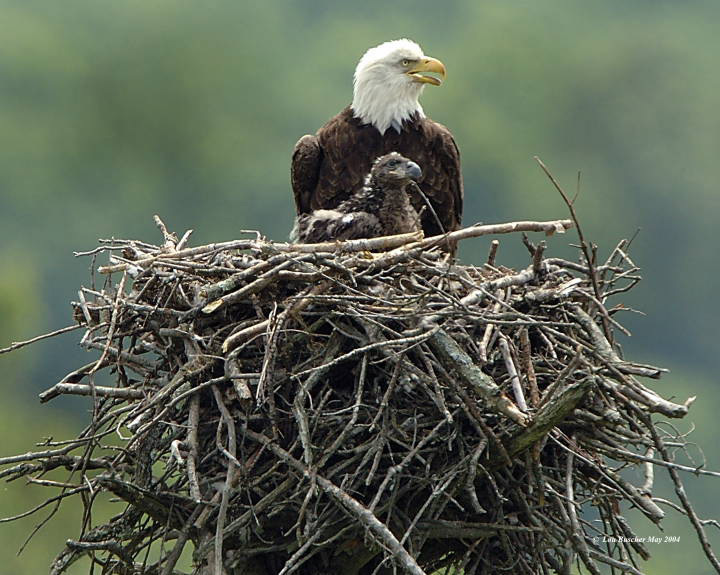 In the 1970s, there was just one eagle’s nest in Pennsylvania and one in New York. Today, there are more than 200 in each state. In addition, 150-200 bald eagles migrate to this region each December, January, and February in search of open water to fish along the Delaware and Hudson Rivers and their associated tributaries and reservoirs. Bald eagles require large, undisturbed tracts of forested land near rivers, lakes, and streams, to build their nests. Ideally those nests are 300 to 1,600 feet from any manmade activities or development. Tall and sturdy mature coniferous and hardwood trees can support the huge nests and offer protected areas from which eagles can hunt. Wintering eagles, which do not construct nests here, require that same undisturbed land for safe nighttime roosting. These intact forested areas also protect eagles from wind, rain, and snow, allowing them to stay warm and dry to conserve their energy for hunting. Bald eagles mate for life and many breeding pairs will use the same nest or habitat area in successive years, sometimes for thirty years or more. Nesting activity typically begins in early February, when eagles may begin constructing new nests or making repairs to their existing nests. Male birds bring sticks and other materials to the female to construct or maintain the nest. Eagles’ nests are quite large, typically at least five to six feet in diameter and three or more feet deep. Each year, as the eagles maintain the nests, they get larger and may be as much as nine feet in diameter. If a nest is disturbed through human activity or natural causes such as storms, the eagles may be forced to abandon the nest and begin construction elsewhere, which can be detrimental to the birds’ survival. Bald eagles are extremely sensitive to human disturbance, so it is important to remain inside viewing blinds when eagle-watching, and to avoid going near an eagle’s nest. Eagles are also quite territorial during the breeding season and will defend their nests from intrusion from other wildlife (including humans!). However, after the young have fledged, communal roosting is common during the following winter seasons. The average territory of a breeding pair is approximately 250 acres. As our region becomes home to more breeding pairs, it is even more important that lands and waters are protected to allow the eagles sufficient room to establish a breeding territory and to hunt for food. The primary threat to the survival of bald eagles today is habitat loss. Eagles face the same threats that people do: water pollution from activities such as fracking and unmitigated run-off; loss of trees and forested areas due to incorrect and wasteful timbering; and the accumulated effects of other activities such as poorly planned development and careless or reckless people and industry. FACT:Bald eagles are the record-holders for the largest nest. The biggest one was found in Florida, and was 20 feet deep, 9.5 feet wide, and weighed more than two tons. 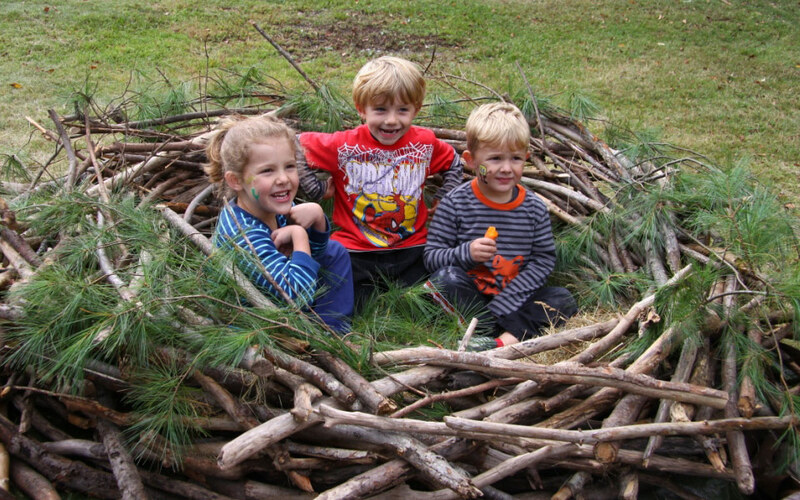 Three children sitting in a life size eagles’ nest.